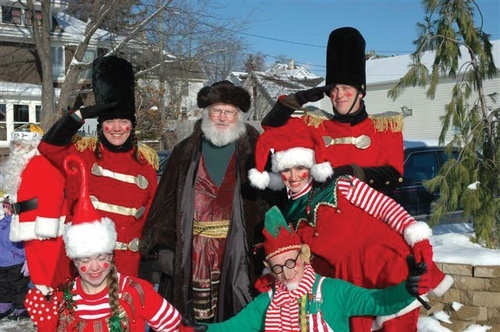 Come and experience old world charm during Stoughton's magical, Victorian Holiday Weekend. Below you'll find a detailed description of the days events. The 28th Annual lighting of the Love Light Tree takes place at 4:30 on Thursday, 11/29 . Join the lighting ceremony at, Stoughton Hospital Bryant Center- 900 Ridge St. The Stoughton High School Madrigal Singers perform at the Stoughton Public Library, 7-8 located at 304 S. Fourth St. on Thursday, 11/29. Friends of the Library Book Sale begins at the Stoughton Public Library, Thursday 6-9 for the general public, Friday 9-5, and Saturday 9-3. You can dine with a festive menu at 51 South Thursday through the weekend. One of Stoughton's newest gems is located at, 208 W Main St. The festivities continue Friday, November 30th 6:30pm-10pm, with the opening gala hosted by the Stoughton, Oregon & McFarland American Cancer Society Relay For Life at the Stoughton Cress Funeral Home. Enjoy the sophisticated vintage music of Second Swing Around, a beautiful assortment of hors d?oeuvres as well as a wine and beer bar. Please consider a $5 donation. Just the beginning to a wonderful and fun-filled weekend in downtown Stoughton! Sponsored by the Stoughton Fire Department, the Holiday Light Show returns to Stoughton Rotary Park on the corner of Sixth and Jefferson. Thousand of holiday lights are timed to music station, 88.5. Festivities continue Saturday at Chorus Public House, 154 W. Main with the Winter Artisan Market 10am-6pm organized by the Stoughton Community Farmers Market. You will find hand crafted treasures made by local artisans, live music, and cafe service. This is the perfect chance to finish up that Holiday shopping. Second Chance Animal Advocates Arts,Crafts, and Bake Sale, Saturday 9am-4pm and Sunday 9-2 at THE COMMUNITY BUILDING, 320 North St. Help dogs and cats in need! The arts, crafts, and bake sale HAS MOVED to the Community Building! treats and candy! Pulled pork sandwiches, hot dogs, hot beverages, and popcorn. All food proceeds go to animals in need. Santa drops by Chorus Pubic House to visit his workshop from 11-2 on SATURDAY! The Stoughton Kiwanis Club and the Stoughton High School Key Club invite families with children to join for an afternoon of fun at Santa?s Workshop!!! This event is free for kids and an adult chaperone is required. Santa's Workshop includes a visit with Santa Claus, picture with Santa, live music, cookie decorating, face painting and several craft making tables. Stoughton High School Madrigal Singers stroll through town in full period costume on Saturday from 10-12:30. Their performance is not one to miss! Horse drawn carriage rides return 12-3! Enjoy a trot through downtown and while helping the Stoughton Community Farmers Market raise needed funds. Rides begin in front of Chorus Public House. $5 per person with a max of $20 for a family. Holiday Trees. A special exhibit of immigrant trunks including a steamer trunk that belonged to Sevrina Swalheim, an immigrant featured in one of the electronic story books. Livsreise is located at, 277 W Main St. The fire truck parade will illuminate the sky Saturday evening at 5:30 travelling east on Main. Swing by the fire station, 401 E. Main after the parade for face painting, a warm cup of apple cider, some elves, and visit with Santa. The City Band will play Holiday music to set the cheer! Saturday evening, 7:30-10:00, The Stoughton Opera House hosts, Suzy Bogguss?s Swingin? Little Christmas featuring Suzy and her 6-piece band is a joyous, festive evening of traditional songs and spontaneity. Tickets are $30. Call 608.877.4400. Head to the Stoughton Public Library at 2pm on SUNDAY to enjoy an afternoon of holiday reading by you! People of all ages are invited to join and read aloud excepts or an entire a holiday story. Live music by My Trio® and holiday refreshments will highlight the afternoon. Register in advance at the Library by Nov. 29. Close out the weekend with the Victorian Holiday Tour of Homes on Sunday 3pm-7pm. Four beautifully decorated homes are mapped on a $25 ticket available at McGlynn Pharmacy in Stoughton. Or, purchase tickets for $30 at the door of any of the four homes on the day of the self-guided tour. Funds raised benefits the 2019 American Cancer Society Relay for Life of Stoughton, Oregon and McFarland. Check the schedule for complete details.